Brutal but beautiful. Weighing in at just over 2.3 tonnes, this Range Rover SVR from the Land Rover Special Vehicle Operations division (think BMW //M or Mercedes AMG as equivalent) will still propel you from 0-60mph in a mere 4.5 seconds. Be under no illusion – this heavyweight has athleticism in the genes. 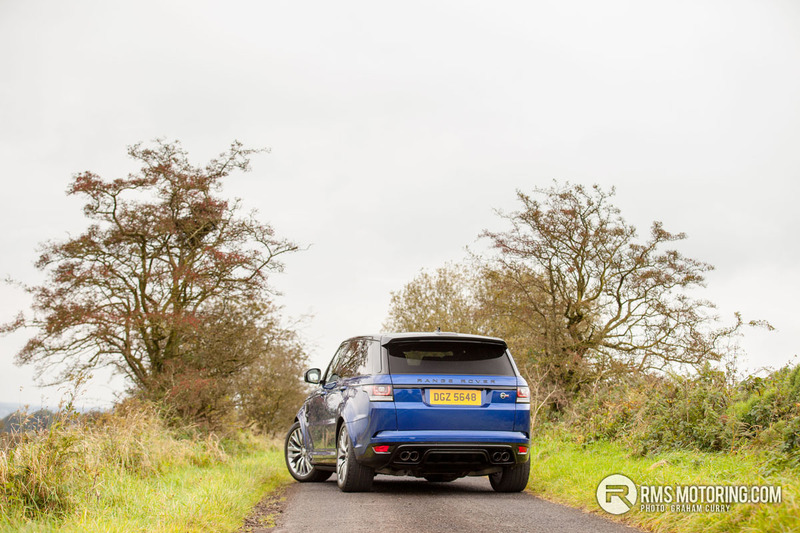 Thanks to Land Rover Belfast, I had the pleasure of this Range Rover SVR pictured over a weekend for review and I must say that even after a few weeks, I am still lost for words on how best to describe exactly what the SVR is about. With most reviews, after an hour or so I can give anyone who cares to listen, a reasonably accurate response as to my views of the car and what exactly it aims to achieve. 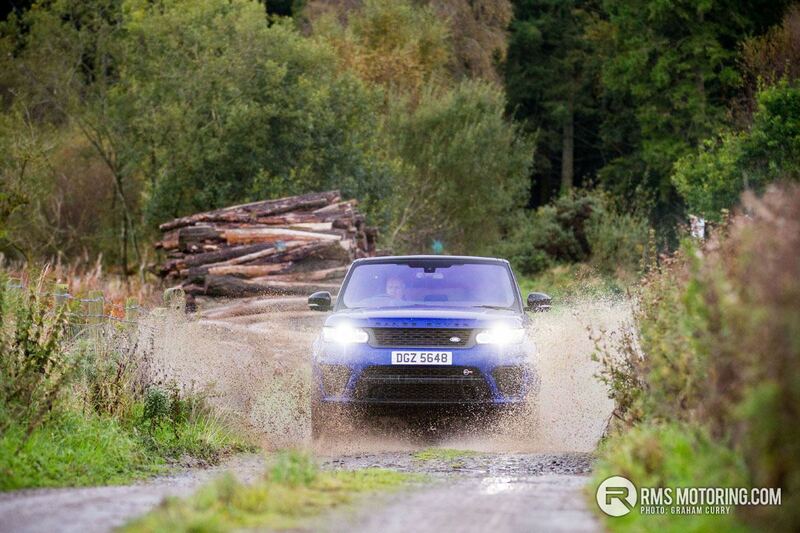 However this Rangie is one that has beaten me and I still struggle to comprehend exactly what it is about, though I do know that it has removed the Audi RS6 Avant off my “lotto win daily driver” list completely and if the numbers came up the SVR is one of the first purchases that would be made. At a glance the SVR stands out like a streaker at 2am in Shaftsbury Square due to the stunning SVR only Estoril Blue metallic paint colour with the top half of this model being finished in gloss Black (a full range of colours and options are available for the SVR) and I feel the combination of this demo is the only option for the SVR. There are some major stand out features that set the SVR apart from lower spec Sport’s and these are the mega Brembo brakes that are blue in colour as well as the four stainless tailpipes that protrude from the rear bumber and could house small furry animals in winter. LED headlamps guide the way while safety and driver convenience is aided with auto headlamps, auto high beam and auto wipers. Keyless entry makes access simple and on opening the doors electric side steps unfold themselves from the underside of the car to assist getting into the SVR. 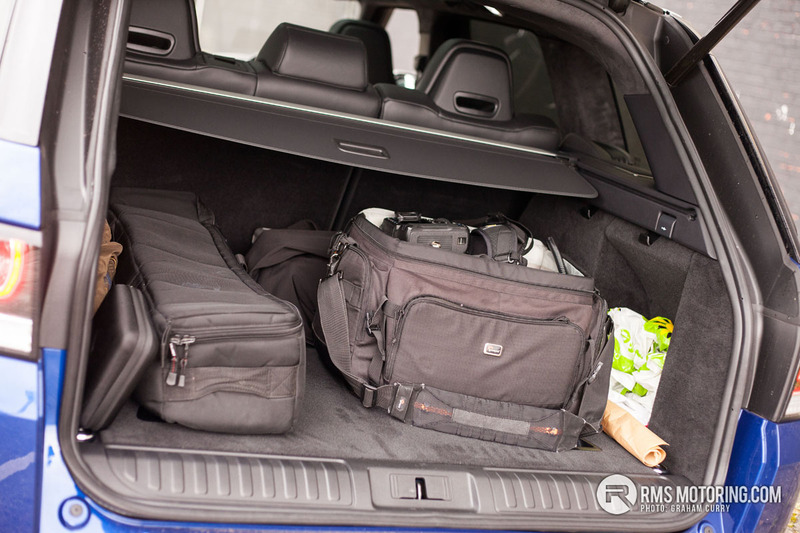 Before going inside I needed to load my camera gear into the boot which is very substantial with a few cubby holes and hooks to hang stuff on as well as anchoring points on the boot floor. As expected with such a vehicle the tailgate is opened and closed electrically via the push of a button. Having a sneak peek through the side window and the dash is very much a familiar sight across the brand these days however the SVR has the added addition of the aesthetically pleasing and weight saving material carbon fibre. It is on the steering wheel, door cards, and dashboard as well as the centre console both front and rear. The SVR really sets itself as an SUV that means business with its seating, seating that can only be described as four reclining bucket seats with an area between the two rear seats for a very small bum. This model tested is finished in full black leather, with white piping and SVR livery embossed on the seat backs. 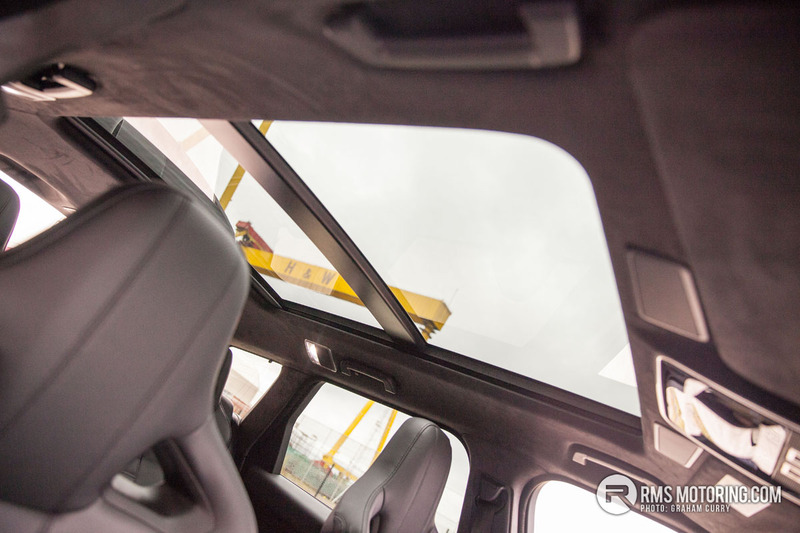 The outer rear seats are heated whilst the front seats are fully electrically adjustable which are heated as well as cooled and despite being perhaps a little firm for some owners, provide more support than the #GAWA and #COYBIG fans at this year’s Euros. For me personally, the seating is perfect in every way. To compliment the mass of hide and carbon, the pillars and roof have been treated to dark alcantara which is sumptuous for want of a word and contained within is a panoramic tilt / slide glass roof. Adjustable mood lighting sets the tone whilst the heated steering wheel removes the need for the impossible to ever find driving gloves. Front and rear room is excellent, four large adults would easily thunder across Europe for a few laps of the Nürburgring to embarrass some dedicated sports cars in comfort and style, in fact I am pretty sure that the SVR does or until very recently did hold the lap record of the ‘ring within the SUV segment, an accolade that highlights the SVR’s capability. Tech is in abundance with this car having Sat Nav, Bluetooth, Radio, DAB Radio, USB & AUX input as well as the dual view screen which impressed me greatly in the full fat Range Rover that allows full digital TV playback on the move for the passenger whilst not for the driver to keep in line with road safety laws. The speaker system is a Meridian Surround system that sounds great and also visible and controllable via the full colour screen in the centre of the dash is the parking sensors, headed seats, mood lighting, vehicle settings and 4×4 drive data when in some of the various all terrain settings. Parking assistance is in the form of 360 degree camera’s as well as sensors on this model and I must say the “birds eye” view is incredibly handy for many a parking situation, as well as live view at a T junction utilising the frontal camera to get out of a nasty junction. The SVR has all the toys, but even more noise thanks to the very potent 5.0L supercharged V8 petrol engine that you would find in the F-Type R. It has a trick active exhaust system which by feature of a dashboard button activates valves which can tame the noise or allow the SVR to sound the way it behaves on the road, popping and banging when unburnt fuel on overrun reaches the system. Awesome. Producing a potent 550PS with 680nm the SVR is far from slow but the fascinating thing is that this heavily road focused Range Rover is not only capable of chewing up the likes of the ‘Ring in record breaking times with the help of the Dynamic Response System, but is also as capable as any Range Rover is expected to be off-road, with the Terrain Response System. The “pop up” gear selector knob commonly seen across the Land Rover range of vehicles has been ditched in favor of a gear selection stick for ease of explanation which gives the look of something less automated and more sports feeling. The Gearbox is an 8 speed ZF ‘box that I will admit fooled me into thinking it was a twin clutch ‘box as it was so smooth and super-fast when using the paddles in sport mode. The V8 is far from lazy and with the supercharger, power is on tap as and when required. Being frugal is not something such an engine is built for and frugal it is now, however on average over a full tank of petrol I was getting just over 18mpg which for what this SUV is, isn’t too bad at all, and helped a little with the stop/start technology. Despite being able to waken the dead, inside the SVR is incredibly quiet from road and exhaust noise due to the sound insulating glass. Even when being revved hard through the gears, which the SVR rewards you for, inside was calm whilst the storm rumbled from the exhaust pipes. One thing about the SVR that amazed me the most over the weekend with it, wasn’t so much the power and noise as I have driven plenty of things as fast or faster, maybe not the size and weight of the SVR I will admit but still such power is something I am used to. It was indeed the road mannerisms that amazed me. The SVR corners better than most new cars, and a spirited run along a meandering B-road soon made me realise just what the Dynamic Response System does, as there was very little body roll which for such a vehicle is almost unheard of and as such explains why the SVR is so good as an all-round package for those who want everything from just one vehicle. 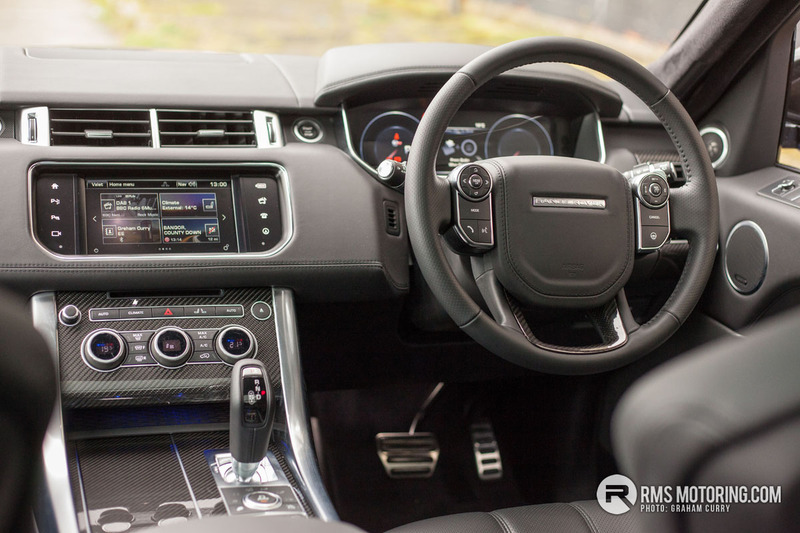 The Terrain Response system has a Dynamic Drive Mode which as far as I am aware is standard on all Sport models, and when activated the digital dials behind the steering wheel glow red and the SVR really does come out of its shell. I would nearly go as far as saying that it is too fast for our roads but really, there is no such thing as too fast, it just means that to get the full potential from it, you may well have to partake in the odd track day. On that note however, the SVR can legally tow up to 3000kg, meaning that you can tow the race car to your circuit of choice, and once it runs out of tyres or fuel, the SVR could be fully explored until the chequered flag drops. So who buys an SVR then? Well for me it is someone that needs performance, practicality, agility and off-road ability all in the one vehicle. So instead of having a Ferrari for performance, an Audi A6 avant for practicality, a Mini JCW for agility and a Land Rover Defender for off-road ability, where by you have four insurances and taxes to worry about to get your fix, you would just buy a Range Rover Sport SVR which ticks all the boxes with ease in one large, fast, backfiring package! Pricing starts around £93k which isn’t too much more than a fully loaded Sport so in my mind worth the extra money and the chances are the SVR’s value will be stronger in a few years’ time with annual road tax coming in at £515/annum. Being built to order, however not restricted to a limited build run, the SVR won’t be overly common on our roads but expect a small wait if ordering. Did you work on it @mk2driver ? | Did you work on it @mk2driver ? There's one lives not too far from us and the noise it makes is incredible. It can shift too!! A friend of mine has one of these on order, can't wait for a blast in it when he gets it in the new year. Great write up. | A friend of mine has one of these on order, can't wait for a blast in it when he gets it in the new year. Great write up. @mk2driver do you know Richard Lewis? | @mk2driver do you know Richard Lewis?